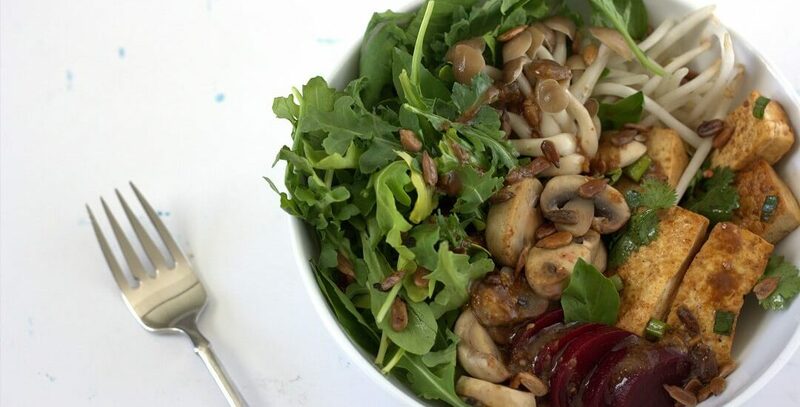 this sweetgreen shroomami is a mushroom grain bowl with miso ginger dressing from sweetgreen, one of my favorite salad/grain bowl chains. it’s packed with kale, beets, tofu and spicy sesame seeds for a really hearty entree. all i do these days is work, potato and go out with friends. which is fine and dandy and it seems like that’s the routine that most people adhere to. but i’ve been feeling a little guilty about that; why do i get the luxury of doing exactly what i please without bettering the world? so i signed up to volunteer to help collect leftover produce from the farmers market for a community org last weekend. they’ve collected almost 100k lbs of produce this year (which means you can skip the gym if you volunteer). to go with the mountain of vegetables i lifted, how about the sweetgreen shroomami? it’s a rice bowl with plenty of kale, crunchy bean sprouts, tender mushrooms and crispy tofu, sauced in a veil of miso and ginger. the dressing and basil are my favorite parts of the whole bowl. but its $13 a pop, which means that it’s a treat yourself lunch rather than something you can have multiple times a week. or you can prep a big batch on the weekends and be that person who brings homemade grain bowls to work for lunch (and not the person who is famous for heating up their signature sardine + hard-boiled egg + mayo salad). 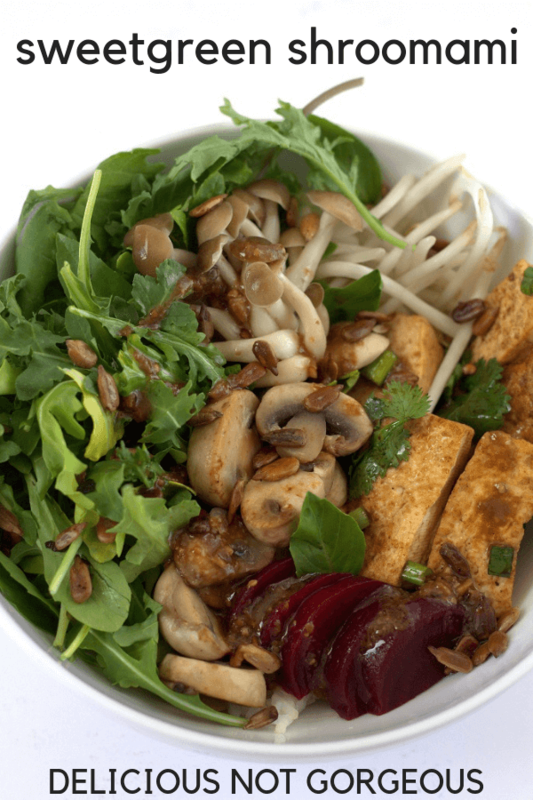 This sweetgreen Shroomami is a mushroom grain bowl with miso ginger dressing. It's got a great mix of crunchy and tender vegetables, spicy sunflower seeds, chewy grains, crispy tofu, basil and a flavorful dressing. Combine all ingredients until smooth. You can do this in a blender, but I just whisk it. Combine the dressing and kale; let marinate while you prep the other components. Mix all of the spicy sunflower seed ingredients on a lined sheet pan, then spread out in a thin layer. Bake at 350F for 15 minutes or until well toasted. Cool completely. Heat the oil in a large frying pan over medium heat. Add the mushrooms and some salt, and saute until shriveled and dark brown. Heat some oil in the same pan over medium heat. Add the tofu and cook on all sides until golden. This does take some babying, but it’s well worth it. Transfer the tofu to a bowl and toss with the remaining ingredients. Place the rice in the bottom of a bowl, and top with remaining ingredients. Drizzle over dressing to taste. This bowl looks so yummy. I am such a mushroom lover that as soon as I saw this I was like “I need that for dinner! !” Lol. And good for you for volunteering! That’s awesome! thanks kelly! 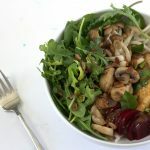 mushrooms are so tasty and so versatile. 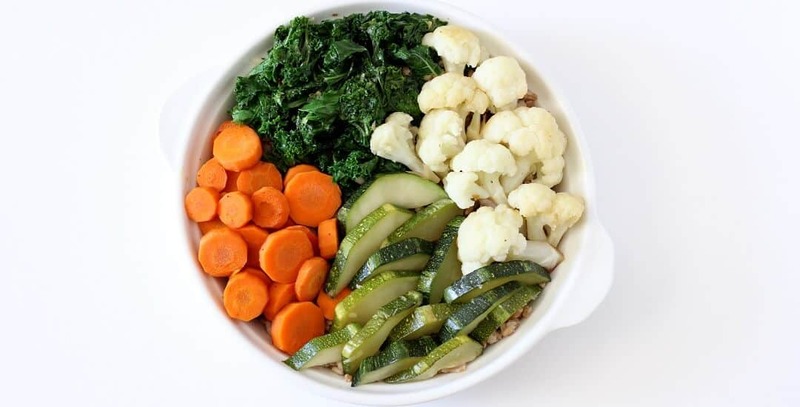 This bowl looks amazing, Heather! The ingredients in that dressing have my mouth watering. Pinning so I can make this soon! I agree, volunteering by carrying heavy produce is totally a gym-substitute! Good for you! the dressing definitely makes this bowl! yes! i’m so glad that my community organizes this sort of thing. Good for you for dedicating some time to volunteering – it can be so hard to fit it in! Loving all those mushrooms…mmmm! That is one seriously good-looking bowl of food. You are so awesome for volunteering like that Heather! And mmmm, why wasn’t this grain bowl my supper tonight? 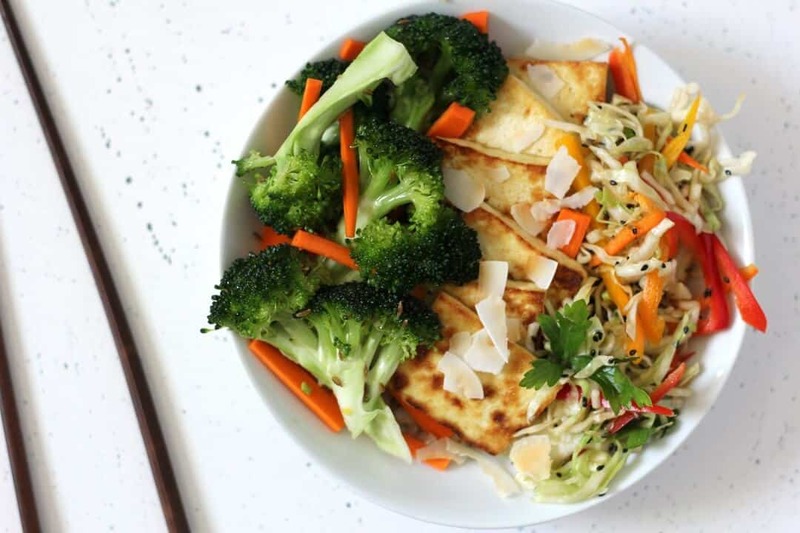 Looks like the perfect vegetarian entree, and I am drooling at the sound of that ginger-miso dressing; I feel like it’s one of those dressings capable of making anything taste better.